Happy Friday, friends! If you follow our Facebook page, you probably saw that we are going to be introducing you to the awesome team at Element over the next few weeks! Every Monday during this series will be #MeetMeMonday, where we’ll post a picture of our featured team member of the week with a short bio and a fun fact! Our Friday blog posts will be #TeamTakeovers, where you’ll be able to get to know our team members a little more! We can’t wait to introduce you to the Element Team! 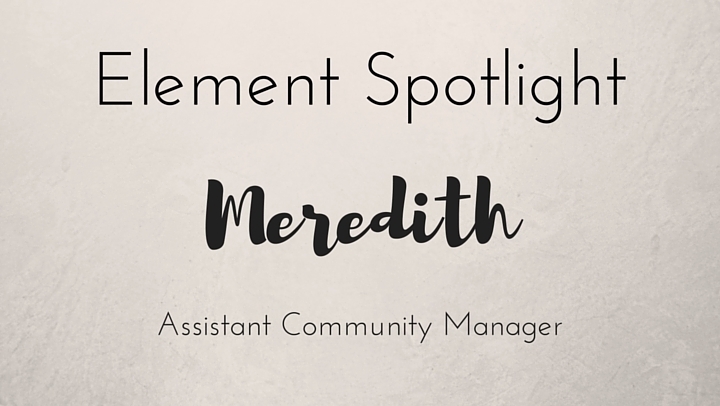 This week, we interviewed Meredith, our Assistant Community Manager! Hanging out with my family and shopping! What’s your favorite food that you can’t live without? Smokin’ Aces, there’s so much action, it keeps you interested! And it has a ton of good actors in it! My dad and my grandfather, because of the values that they instilled in me and what they were to me. I looked up to them. Definitely a cooler full of cold drinks! Bora Bora, because it just looks beautiful! Ever since I watched Couple’s Retreat, I decided I wanted to go there someday! Italian Delight! Get the manicotti! The saltwater pool, it’s great for relaxing on a hot Summer day! Don’t forget to follow us on Facebook for next week’s #MeetMeMonday!